The Case Western Reserve University men’s tennis team produced winners in all four singles flights and captured one of two doubles flights at the season-opening W&L Invitational hosted by Washington & Lee University on Saturday and Sunday, September 8th and 9th at Duchossois Tennis Center. Senior Kyle Gerber totaled five wins for the weekend to break the program’s all-time wins record. The Spartans ended last season with the No. 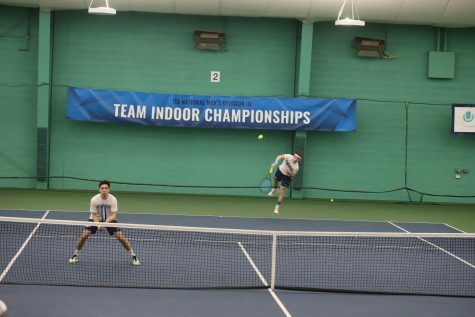 17 ranking in the Intercollegiate Tennis Association national poll after qualifying an individual and a doubles tandem for the NCAA Championship Tournament. Gerber, who entered his senior campaign with 93 combined wins in singles and doubles play, won the Flight A Singles title and teamed with junior John Healey for a runner-up performance in the Flight A Doubles Bracket. Gerber’s five victories bring his career total to 98. He passes Ben Sinder, who played from 2003-07, for the most wins in program history. Competing in the top singles bracket, Gerber opened with a 6-4, 6-1 victory versus Rand Jackson of The University of the South. The senior then bested Hayden White of Washington and Lee in three sets (6-4, 3-6, 6-4) before sweeping (6-4, 6-2) Ross Silverberg of Franklin & Marshall College to claim the Flight A Championship. In doubles action, Gerber and Healey started with an 8-1 victory versus Nolan Bacchieri and Doug Kaplan of Franklin & Marshall then advanced to the finals via an 8-4 decision against Rand Jackson and Sean Laughlin from Sewanee. The other three Spartan singles titles came courtesy of junior Eric Klawitter in the Flight B Bracket, freshman Santiago Guerra in C and Healey in D.
Klawitter swept all three of his opponents and won the bracket by scores of 6-4, 6-1 versus freshman teammate Christopher Krimbill. Guerra was 3-0 in his collegiate debut with his toughest match coming in the semifinals when he ousted Thomas Johnson of W&L in three sets (2-6, 7-5, 6-4). 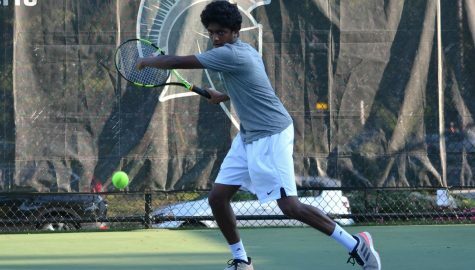 Healey swept all three of his opponents in the D Bracket, including freshman teammate Viswajit Simhadri by scores of 6-1, 6-1 in the finals. In Flight B Doubles play, Klawitter teamed with senior Nicolas Howe for three wins. After winning their first two matches by identical 8-0 scores, Klawitter and Howe needed a tie-breaker to defeat Krimbill and sophomore Will Drougas, 9-8. The Spartans are back in action next weekend at the Kenyon College Invitational on Saturday and Sunday, Sept. 15th and 16th in Gambier, Ohio. The United States Tennis Association/ITA Central Region Championship in Indianapolis, Ind. follows on Sept. 22-24.